When it comes to buying or leasing a car, good credit is often a necessity, as most of us can’t just mosey down to the car dealership and buy a car outright. But there isn’t a specific credit score that you need in order to get financing, as that can vary from dealer/financier; not to mention other factors that come into play. For example, you may have a relatively light credit history, but nothing derogatory dragging you down, so your credit score may be quite high. However, at the same time, if you’ve never supported a large amount of debt, such as an auto loan, car lease, or a mortgage, the dealer may be hesitant to offer you a loan. This is actually a pretty common scenario. A consumer may think they’ve got excellent credit because they have a high Fico score, but if the only thing they’ve got on their credit history is a few credit cards, auto lenders may balk when it comes to issuing a loan. So if this sounds like you, it may be in your best interest (or a necessity) to get someone with more established credit to co-sign on the new auto lease or loan. Conversely, a consumer with less than stellar credit may get approved with little difficulty for the same auto loan you wanted just because they have past auto loan history on their credit report. The way dealers see it, even though that three digit number isn’t quite as high as they’d like, the consumer displayed the ability to repay an auto loan in the past, so a subsequent loan seems reasonable. 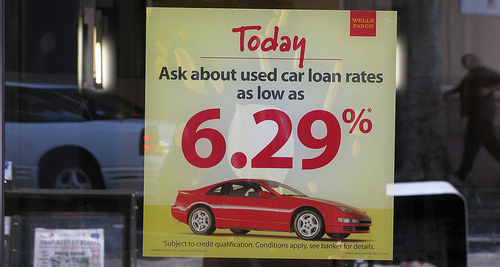 However, keep in mind that the lower your credit score, the higher the interest rate will be on the auto loan or lease. So you’ll still want to make sure your credit score is as high as possible to get the best deal. And many car dealers only pull a credit score from a single credit bureau, such as Equifax, Experian, or TransUnion, instead of using a tri-merge credit report, which uses the median score from all three bureaus. For this reason, it’s important to ensure that your credit is ship shape with all three credit bureaus, as you’ll never know which one may be called upon for your loan approval. Tip: The credit score they use may have a special range used exclusively by auto dealers and their associated financing companies. If your credit isn’t sufficient to get that new car, the dealer will usually work with you to ensure that a sale/lease is completed. This could involve bringing in a co-signer, such as a parent or spouse with more established credit, or charging a higher interest rate to offset risk. It’s probably wise to consider a co-signer if the lender/dealer wants to charge you a premium based on your credit alone, or hold off until your credit score improves. Remember, you can obtain auto loan financing via a bank or a dealer, so shop around. Previous Previous post: Chase Slate Credit Card Review – Get a No Fee Balance Transfer!